Today we welcome back Rachel who joins us this Sunday at Worthing Charmandean for our St Barnabas Christmas fair. 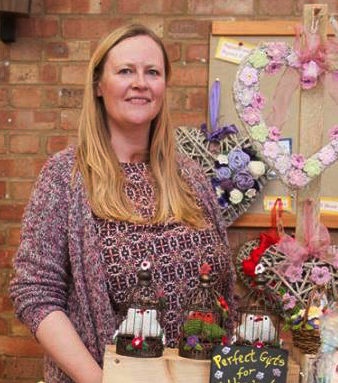 My name is Rachel and I am the creator of all things flowery – Rachel’s Wreaths and Flower Crafts. 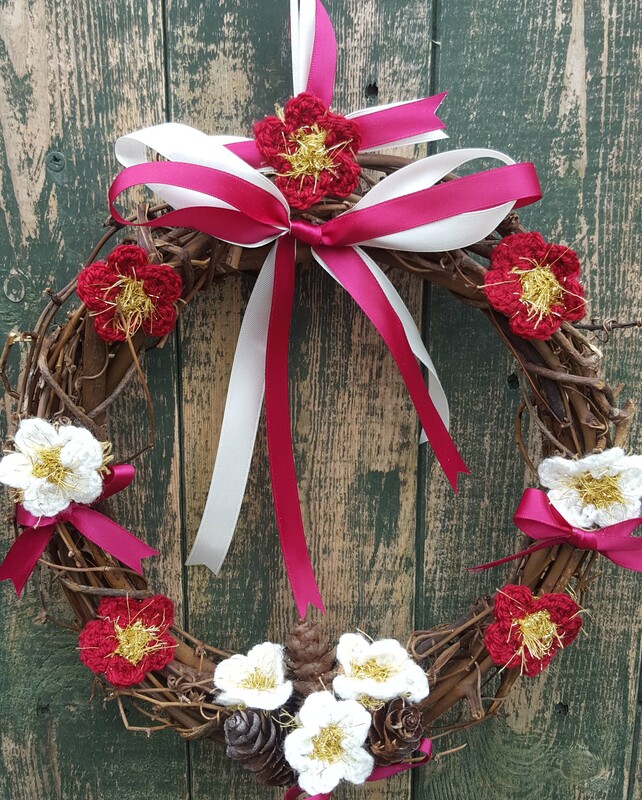 Rachel’s Wreaths was created from my love of flowers and knitting. 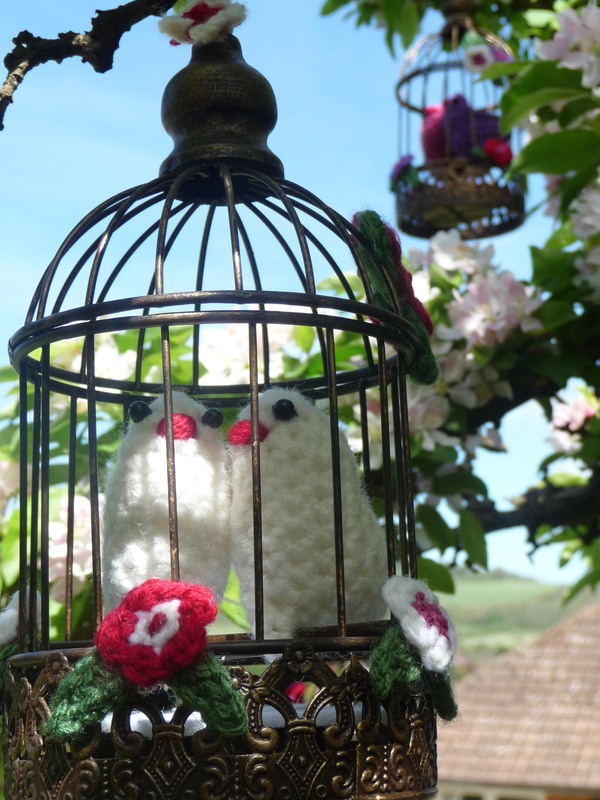 And before anyone says hang on a minute those flowers are crocheted… let me explain! My Nan taught me to knit when I was little, I also remember my Mum creating little knitted items for my dolls and teddies. Over the years I gradually moved from knitting my teddies jumpers to school craft projects. At the same time I started working at the weekends in a garden centre and my love of flowers began. Fast forward a few years and I had gained a degree in sculpture, a masters degree in design for television and notched up quite a few garden centre jobs including Christmas display and visual merchandising. I then started working within art departments in the tv industry but continued to work with flowers doing seasonal floristry display work for a London Florist. This is where I started making Christmas wreaths and regular purchasers of my wreaths included Ant of ‘Ant and Dec’ – well his wife was in charge of choosing the design! Once I had my son I wanted to combine all of my skills and loves and strike out on my own, whilst being able to have my work fit in with being a Mum. I quickly realised that working with fresh flowers wasn’t going to be a viable option and set to work on developing ideas to create a more unusual way of having flowers in the home that last. Although you can knit flowers, for me, crochet is more organic and sculptural and a medium I learned and really enjoy……. And so that is how Rachel’s Wreaths and Flower Crafts was created! Flowers that last and never wilt! Combining nature with arts and crafts has always appealed and so I would describe my creations as being somewhere between rustic country style and colourfully kitsch! 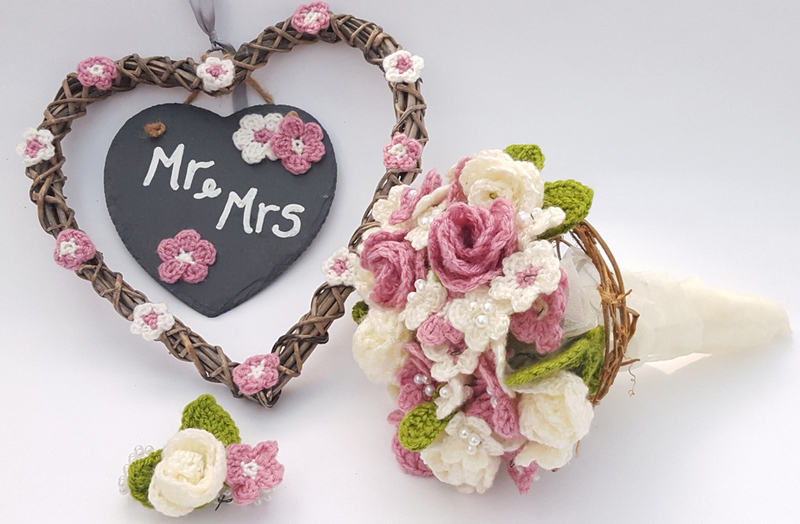 I think my items appeal to different people in different ways: some relate to crocheting themselves, some are reminded of their Nans by my work but mostly I think that the flowers in pretty colour combinations work well being displayed in the home and attract customers of all ages. I have always had a passion for combining colour and complimentary materials to achieve a desirable design, display or item. I enjoy the detail, and the sculptural qualities that can be achieved, experimenting with materials and combining craft skills to make unique items. I have also had a few special commissions this year including weddings. It was a real privilege to be a part of their day and enjoyed meeting my clients, discussing colours and styles with them and being sent photos of the special day was a real treat! I have sent my work to customers as far away as Australia and New York this year, very exciting – the power of the internet! What can we expect to find on your stall at So This is Christmas at The Charmandean Worthing on Sunday 4th December? And are you looking forward to taking part? A large selection of my handmade crochet flowers arranged on wicker baskets, Christmas wreaths and wicker hearts and lots of other seasonal creations like tree decorations and cute Christmas robins. There will also be lots of affordable present ideas and stocking fillers such as hair accessories, key rings, door hangers and lavender bag gift sets. I am really looking forward to being part of this great event and meeting lots of new customers and seeing some familiar faces! I also love when people come up to my stall and tell me that they haven’t seen crochet treated in this way before and thought from afar that the flowers were real! The feedback is always great to hear, and I love hearing the ideas and stories people have to share. 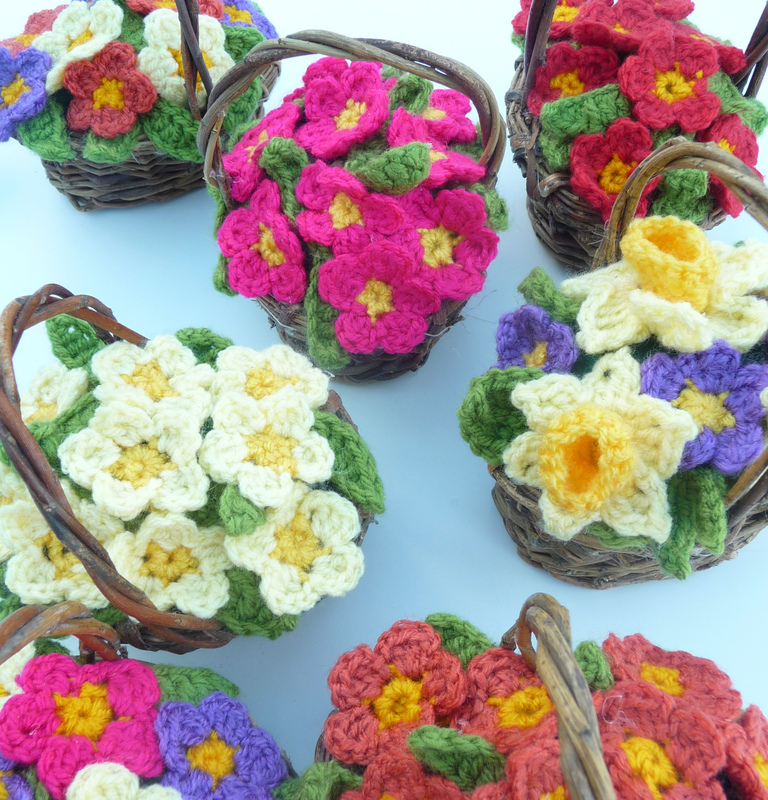 My best seller is probably my crochet primrose baskets, they are bright and cheerful and seem to sell all year. My hanging wicker hearts with flowers and pearly beads are fast becoming a firm favourite too. Train my fingers to work as quickly as my ideas! Also to learn how to use online marketing more effectively. What part of Christmas do you enjoy the most? I love, love, love the build up to Christmas, my favourite day has always been Christmas Eve. I used to design Christmas displays, buying and planning for 9 months of the year, I miss doing that!